Has Hero cracked the ‘150cc commuter’ code with the Achiever? We find out. Admittedly, the first time I rode the Hero Achiever, I wasn't particularly impressed. The bike did not seem to excel in any particular area, had a very conservative design and did not excite either. But while waiting at a stop light, I noticed a gent to my left. He was astride a 110cc motorcycle and seemed to take particular interest in the Achiever. The signal turned green and I rode away wondering to myself why there was an apparent interest in a bare basic 150cc motorcycle. The answer is aspiration. The aspiration to own a premium motorcycle which, for many, begins with a 150cc motorcycle. Commuters these days wish to travel faster and further and that need requires more powerful motorcycles, a 150cc bike atleast. It needs to fulfil all other attributes of a commuter motorcycle. It needs to be comfortable, return good fuel economy and have low running costs. It also has to be affordable to buy. Now the Achiever is what Hero MotoCorp calls a ‘150cc commuter’ motorcycle. It is designed to give commuters the prestige associated with a 150cc motorcycle without compromising on the all important commuter needs. This is no new formula; Hero has had the Achiever for a while now and other manufacturers too have a finger in this very thin slice of the pie. So the question is, has Hero nailed down the commuters requirements with the new Achiever? We find out. First off, design. Hero has taken a very conservative approach with the Achiever’s design. The bike has a very clean design with the focus on having that visual mass that makes it look like a bigger motorcycle. Areas like the fuel tank, body panels and exhaust seem a size larger, the idea being the consumer associating size with premiumness. The seat is wide and should comfortably seat two individuals. The headlamp is a more modern unit while the large tail lamp could have done with an LED setup. The instrument cluster is analogue which, at a time where even 110cc bikes get digital meters, seems like an oversight. This again might be done keeping in the conservative buyer in mind. The rear wheel looks tiny compared to the the rest of the bike but that too is in the interest of better fuel economy. Overall the bike seems to have a design that will age well. The 150cc engine has been carried over from the earlier Achiever but Hero has worked to make it more refined and have better low speed rideability. Power and torque figures remain the same as the earlier motor but with new ignition mapping and a CV carburetor makes the motor more responsive at lower revs. The motor makes 13.6PS at 8000rpm and 12.8Nm of torque at a relatively low 5000rpm. Hero claims a 0-60kmph time of 5 seconds while our VBox test threw up a time of 5.4 seconds for the same. The bike achieved a top speed of 106.5kmph under test conditions. The new Achiever feels more eager off the line and you can also comfortably commute in the city at higher gears. It gets Hero's i3s start stop system that works without a hitch in stop and go situations. It is quite easy to get used to and it helps deliver excellent fuel efficiency in the city. Clearly the way the 150cc engine has been tuned, it is to make your everyday commute easier. Refinement and better low speed rideability are its strong points. It has got strong roll on figures taking 6.2 seconds to go from 30 to 70kmph in third gear and 7.3 seconds to go from 40-80kmph. You can comfortably commute in the city at higher gears. It gets Hero's i3s start stop system that works without a hitch in stop and go situations. It is quite easy to get used to and it helps deliver excellent fuel efficiency in the city. The Achiever uses the same frame and suspension setup as the earlier bike. The bike is tuned towards good ride and it shows. The Achiever has excellent ride at low speeds which gets even better with a pillion onboard. However as the speeds get higher, the suspension tends to bottom out easily. The bike gets drum brakes and the disc you see here is a ?1000 option. The disc brake has good feel but lacks bite. The bike performs best at moderate speeds and is best suited for city commuting with the occasional highway run. Handling is surefooted though the thin Ceat Secura 's do not inspire confidence and begin to squirm when pushed. But there is a reason why Hero have chosen that skinny tyre. Fuel efficiency remains the most important criteria for a commuter when choosing a bike. That seems to be the main focus here with the i3S technology, slim rear tyre and an efficient engine. The Achiever returned 53kmpl in the city with the i3s switched on and 49kmpl with i3s switched off which again is quite a significant improvement. Highways fuel efficiency is 56kmpl which isnt much given the engines tuning for low speed. For example, the achiever shows a speedo reading of 65kmph at 5000rpm while the Suzuki Gixxer shows 72kmph for the same rpm range. 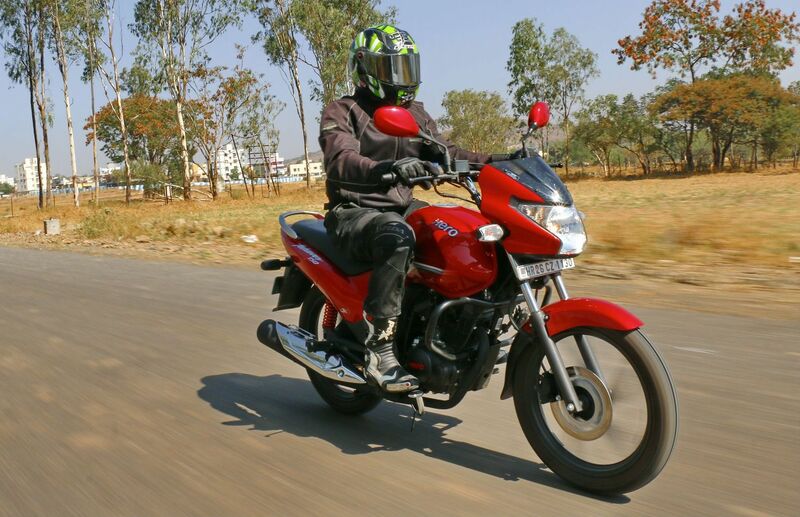 Overall the Achiever delivers fantastic mileage figures for a 150cc bike for city conditions. The Achiever is Priced at Rs 62,800 (ex-Delhi). While the Achiever may face stiff competition from the Honda unicorn, Yamaha SZ and Bajaj V15, it outperforms most of them in two counts - price and fuel efficiency. Both of which are importantly to a consumer looking for something more powerful that the 125cc bikes but does not want to compromise on fuel efficiency, comfort and ease of ride. The Honda Unicorn is priced at Rs 69,476 while the Yamaha SZ retails at 66,944. The Bajaj V15 is priced at Rs 62,133 (all prices ex-Delhi). It is quite interesting that at a time when 125cc bikes are trying to be sportier, the Achiever is heading in the opposite direction by being more conservative, more commuter oriented.The Achiever 150 is a motorcycle with a clear diktat - to offer commuters the prestige and comfort of a larger motorcycle while packing in the practicality and sensibility expected of a commuter. The Achiever delivers on that promise - it offers a bit more pep, comfort and premiumness while delivering excellent fuel efficiency and it all comes at a very attractive price tag of Rs 62,800 (ex-Delhi). The Achiever is a good option if you are looking at a 150cc 'back to basics' bike that focussed mainly on basic needs like value for money, comfort and fuel efficiency.